PRODUCT PACKAGING: NEW – 1 Piar – 0.4 LB – 2 SIZE – 7 kinds of marketing programs. MATERIAL: MEDICAL GRADE SILICONE + VELVET. ENHANCED COMFORT:Absorbs shock,foot cushioning,surface velvet helps keep feet dry. SIZES:8-13(Note:Item with Low Arches,NOT High Arches). These are high quality insoles that are perfect for both men and women of any age. They improve the balance of your step. They depressurize the foot, because they act as a shock absorber while you are walking. These anti slip shoe inserts give you much needed stability. The insole can be used with a range of shoes: work boots, hiking boots, sports shoes or walking shoes. They are good for people with conditions like heel spurs, heel pain, and plantar fasciitis pain, fused ankles, achilles tendon pain, arthritis, blisters, bad knees, bone spurs, and so on. They are made from medical grade silicone and velvet. The insole may require to be cut into the required size so that they can fit your shoes. This has to be done with a lot of care to avoid cutting them in such a way that you remove too much material. They have an outline to help you trim them easily. It’s recommended that you leave a small allowance to avoid leaving them too small for your shoes. Within a few days of use, they mold themselves to the form of your feet. This makes your feet much more comfortable. They can relieve pain you would have normally felt because of your feet’s impact with a hard surface. 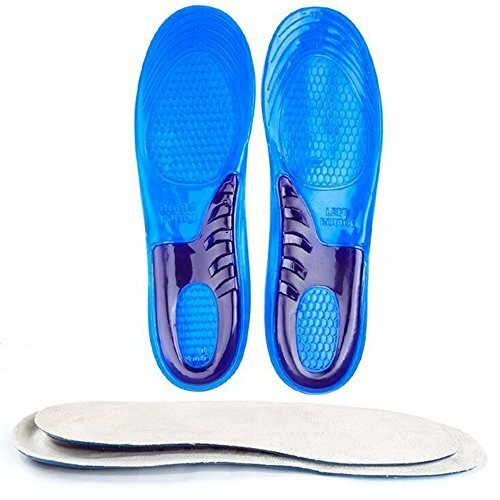 Even for people who don’t feel any pain in their feet, these insoles are a great addition to your shoes. They will make you more comfortable. These are some of the best shoe inserts for plantar fasciitis and heel pain that money can buy. Perfect for all ages and both for men and women. 100% GUARANTEED: When you receive the goods feel inappropriate products, we are willing to accept 100% refunds. We offer a 30 days limited warranty and friendly customer service for you. 2. Please be reminded that due to lighting effects and monitor's brightness/contrast settings etc, the color tone of the website's photo and the actual item could be slightly different. If you have any product questions, please send an email to contact us. We will deal with you as soon as possible(12 hours). Speedfeet staff wish you a happy shopping,thanks so much. PRODUCT PACKAGING: NEW - 1 Piar - 0.4 LB - 2 SIZE - 7 kinds of marketing programs.